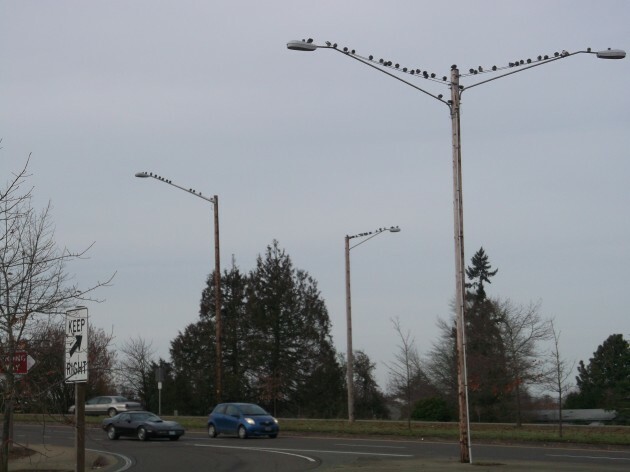 Among the pigeons near the Pacific Boulevard overpass, this seems to be the most popular perch..
Of all the light poles in and near downtown Albany, why do flocks of pigeons habitually perch on two or three of them on the northeast end of the Pacific Boulevard overpass? They seem to hang out there all the time, year in and year out, and there must be a reason, but it’s a mystery to me. The most obvious reason is food. 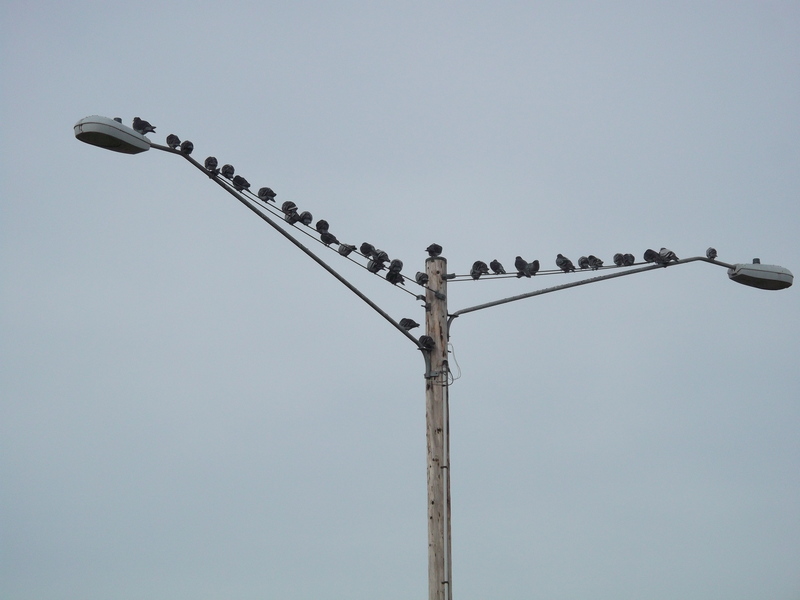 Pigeons, like the rest of us, congregate where they can easily find something to eat. Their natural diet consists if fruit and seeds, but they feed on just about anything edible, especially handouts from people and the crumbs left over at outdoor restaurants.. Despite the traffic and the cold winter wind, it must be some kind of pigeon paradise. This brings to mind my readings of Konrad Lorenz, an Austrian naturalist of the past century. Have you read him? His humrous and insighfuly observations on animal behavior are marvelous. I recommend ‘King Solomon’s Ring’ and ‘Man Meets Dog’. I have yet to read his studies of the Greylag Goose, which are said to be even beter. I expect he could solve the mystery. He would observe their behavior for weeks or months as needed to understand.